Sources tell ABC News the discussions are still on the "working level." 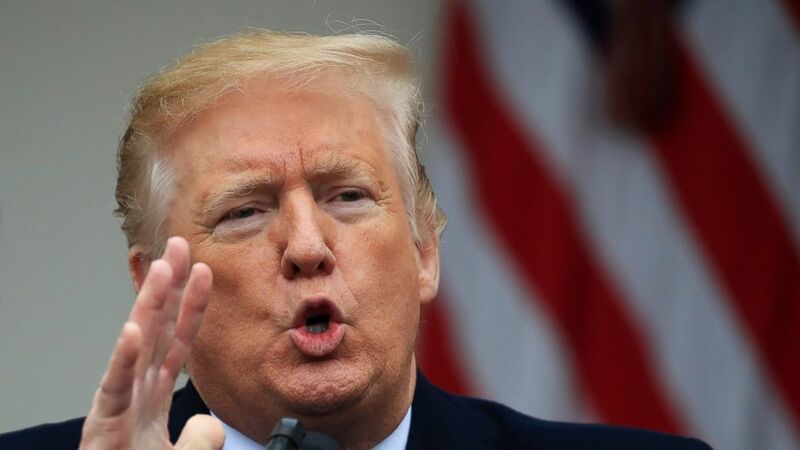 President Donald Trump said Friday he is considering declaring a national emergency to help pay for his long-desired border wall along the U.S.-Mexico border. 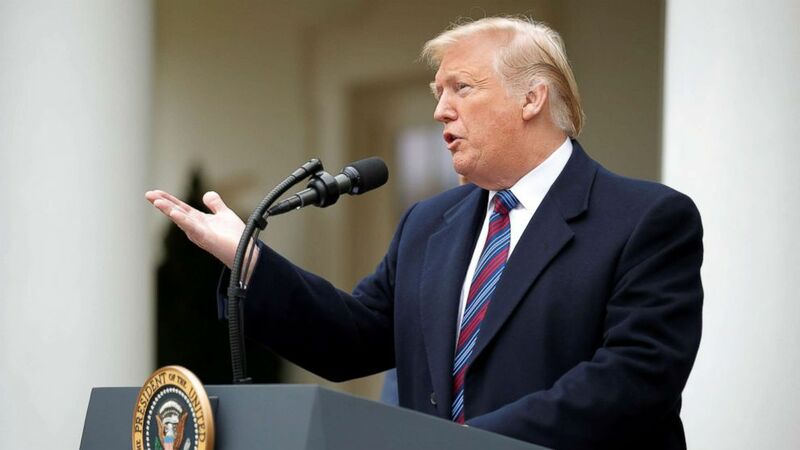 The president, when asked by ABC News' senior national correspondent Terry Moran during a press conference, acknowledged that he would consider declaring a national emergency to help get funds to build the wall "for the security of our country." Earlier Friday, multiple sources familiar with the ongoing discussion told ABC News that options could include reprogramming funds from the Department of Defense and elsewhere -- a move which would circumvent Congress. Sources tell ABC News the discussions are still on the "working level" adding that there's a range of legal mechanisms that are being considered before such a decision is announced. 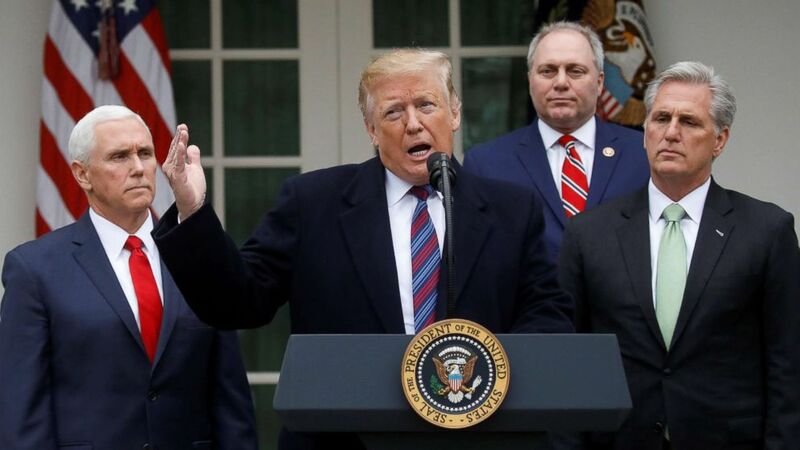 The discussions have intensified as the president is now 14 days into a partial government shutdown, facing newly empowered House Democrats who are refusing to budge issue of wall funding. "We are not doing a wall," House Speaker Nancy Pelosi said Thursday, calling the proposed structure an "immorality." On Friday, the president said he had had a "productive" and "very, very good meeting" after talks with top Democrats and other congressional leaders at the White House in an effort to end the partial government shutdown now heading into the third week. Just minutes earlier, Senate Democratic Leader Chuck Schumer told reporters outside the White House that Trump told lawmakers in their nearly hour and a half meeting that he is prepared to keep the government closed "for a very long period of time, months or even years." In December he tweeted he could use the military to build the wall if Democrats didn't work with him: “If the Democrats do not give us the votes to secure our Country, the Military will build the remaining sections of the Wall. That same day he told congressional leaders in the oval office "this is a national emergency." The relevant section of that code reads: "In the event of a declaration of war or the declaration by the President of a national emergency in accordance with the National Emergencies Act (50 U.S.C. 1601 et seq.) that requires use of the armed forces, the Secretary of Defense ... may undertake military construction projects, and may authorize the Secretaries of the military departments to undertake military construction projects, not otherwise authorized by law that are necessary to support such use of the armed forces." However, sources insist such a declaration would only be a partial solution and wouldn't result in Trump compromising with Democrats on their series of funding bills aimed at ending the current government shutdown that includes no money allocated for a wall. (Jim Young/Reuters) President Donald Trump speaks with reporters following a meeting with congressional leadership on the ongoing partial government shutdown in the Rose Garden of the White House in Washington, Jan. 4, 2019. A House Democratic aide said it would be "completely unacceptable" for Trump to use national emergency authority to try and build the wall using military funds, and that Democrats would likely challenge the administration's actions in court. "If President Trump tries to use such thin legal authority to build his wall, Democrats will challenge him in court," said Evan Hollander, a spokesman for House Appropriations chairwoman Rep. Nita Lowey, D-N.Y. "The president's authority in this area is intended for wars and genuine national emergencies. Asserting this authority to build a wasteful wall is legally dubious and would likely invite a court challenge." A senior congressional official told ABC News that Pentagon lawyers informed Congress in 2018 that the president didn't have the legal authority to use military money to build the wall. However, those conversations did not include discussions of declaring a national emergency, the official said. A former member of the president's inner circle believes the move is possible. “The President has some limited authority to direct the Department of Defense to build portions of the barrier along the southern border," Tom Bossert, Trump's former Homeland Security adviser and current ABC News contributor said. "Depending on what approach he takes, every option available to him comes with some structural constraints and will be met with congressional opposition and legal action -- even the very rare emergency authority that has garnered debate this week. Unless Congress acts, there is seemingly a significant limit to the amount of wall Department of Defense could build." The White House did not respond to ABC News' request for comment for this story. A Department of Defense spokesperson said: "The Department of Defense is reviewing available authorities and funding mechanisms to identify options to enable border barrier construction."